What our goal with this series of basic social media and blog posts is, is to give YOU the working musician, engineer, producer, or even a complete novice session guy, tips and work around ideas for you to become a better musician or professional! We recently sat down with Josh Smith, a monster blues guitarist, to pick his brain for some of his top tips. Josh does a ton of gear demos on Youtube for companies like Morgan Amps and Jrocket audio, and he shoots live videos from his studio, FlatV Studios. Josh has made a career playing for artists as a side man, but he also has a flourishing solo career – he has joined Joe Bonamassa on stage many, many times! 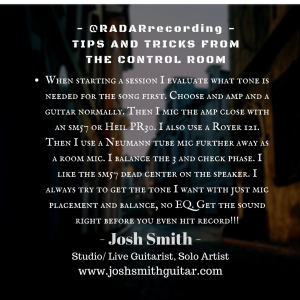 We asked Josh to give us a tip on guitar tones and here’s what he said: evaluate what the song needs! Don’t just come in and do djenty guitar tones if you are in a session for a hard rock song! Starting with just a guitar and an amp will help you hear exactly what you are sending to the mic. Jam that pair for a few minutes and feel out the tone. If it blows your mind right away, use it! If not, experiment… maybe your ’85 Les Paul into an AC15 is too broken up? Josh is a fan of the ’57 (a classic sound and a great choice for any genre) and a PR30 – the 30 is a little smoother on the top end and a bit more round on the bottom. Combine either of those with a Royer 121 Ribbon mic and you are in sonic heaven! “Get the sound right, before you even hit record!” Don’t process an incorrect tone to make it work. Instead, get the correct tone to add all you can to the track.